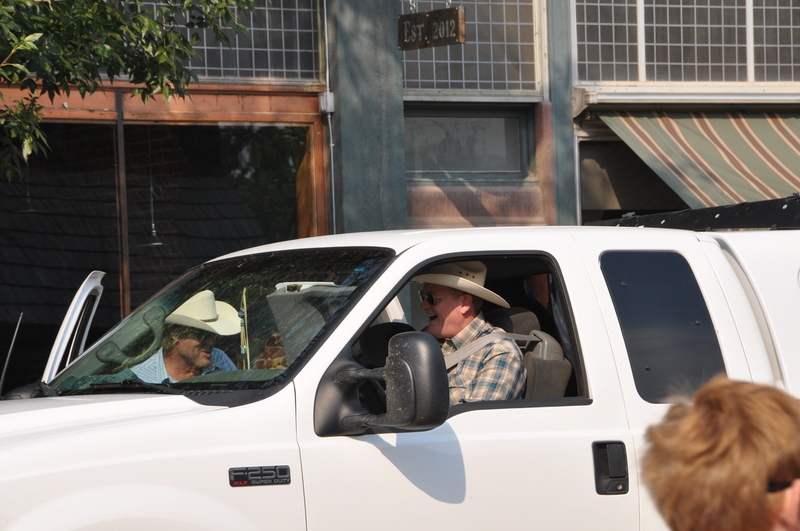 Craig Johnson, author of the Walt Longmire western mystery series, and Robert Taylor, star of the Longmire television series that airs on A&E, arrive at the Absaroka County Sheriff’s Office. Craig Johnson, author of the popular Walt Longmire mysteries, lives near Ucross, Wyoming not far from Buffalo, Wyoming, in the heart of the setting for his books. Buffalo considers him one of their own, and for the past two years have celebrated a special day in his honor. 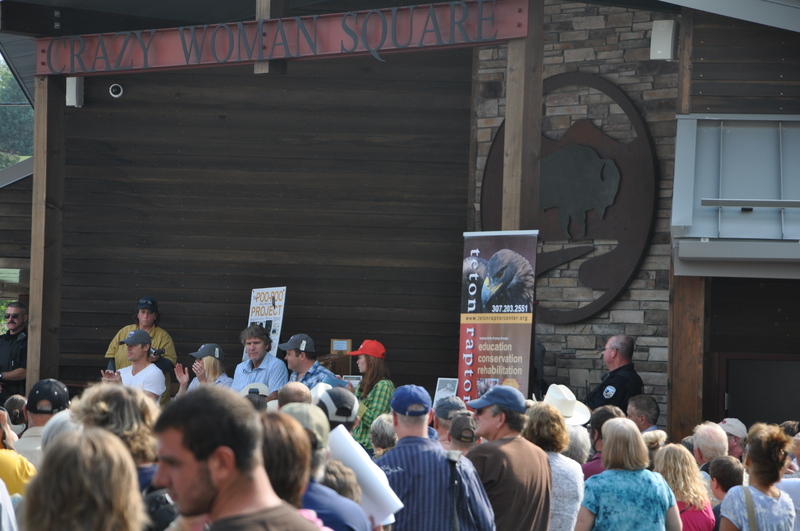 This year we attended the “Walt Longmire Days” in Buffalo. For three days, the Buffalo Chamber of Commerce and assorted others attempted to allow visitors to live for a while in Longmire Country. 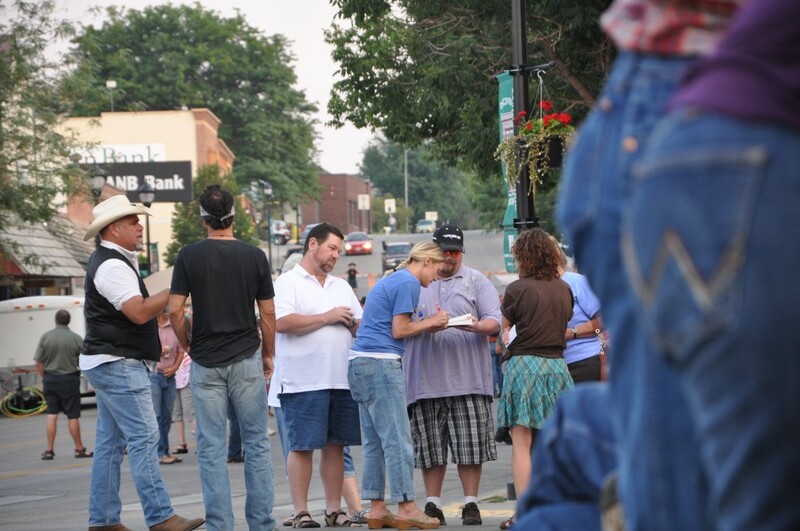 They temporarily changed Buffalo’s name to the fictitious town of Durant, Wyoming where fictitious Longmire has his fictitious Sheriff’s office and invited the stars of the television series to visit. On Friday, motels bearing signs welcoming visitors to Longmire Days began to fill. A few tourists with cameras around their necks wandered the downtown streets. 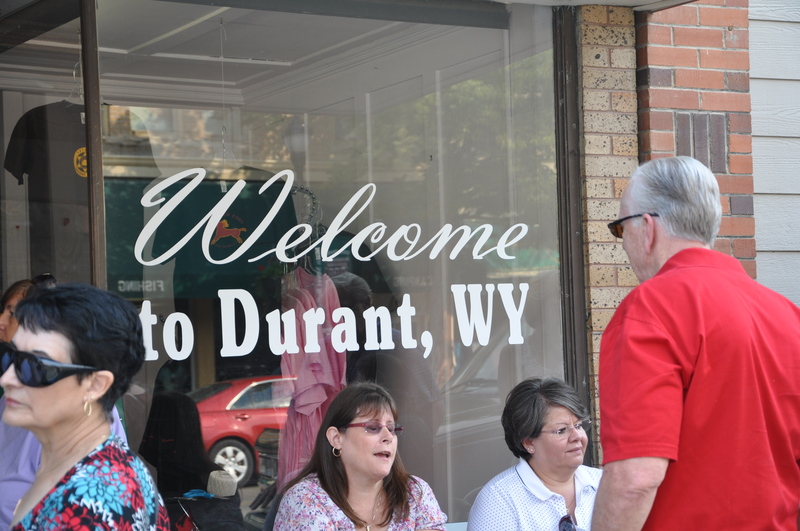 Signs began to appear, telling us we weren’t really in Buffalo, Wyoming but rather in Durant. The local newspaper, THE BUFFALO BULLETIN, put out a special edition for the celebration entitled THE DURANT COURANT. 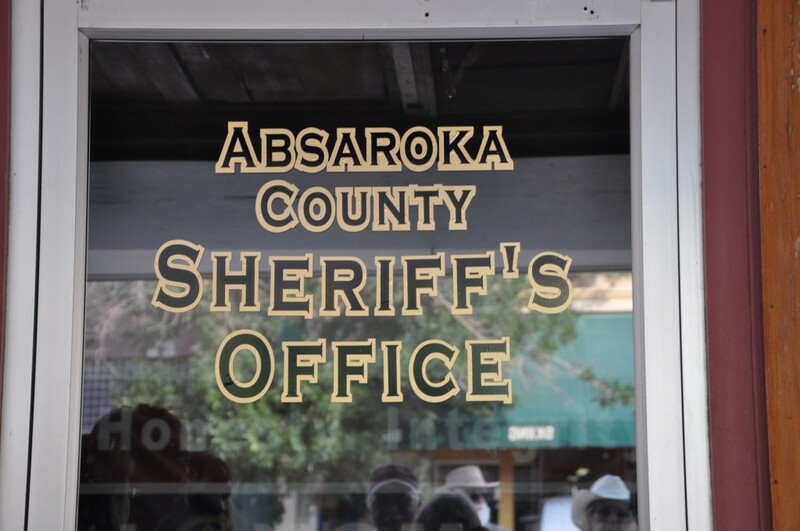 It carried the tagline, “The Voice of Absaroka County.” There was even an official looking gold-leaf sign identifying a building downtown as the offices of the Absaroka County Sheriff’s Department. Although there is an Absaroka mountain range that straddles the Wyoming-Montana state line, Absaroka County, Wyoming is actually Johnson County, Wyoming in disguise. After all, a writer has to have some room for creative and poetic license. 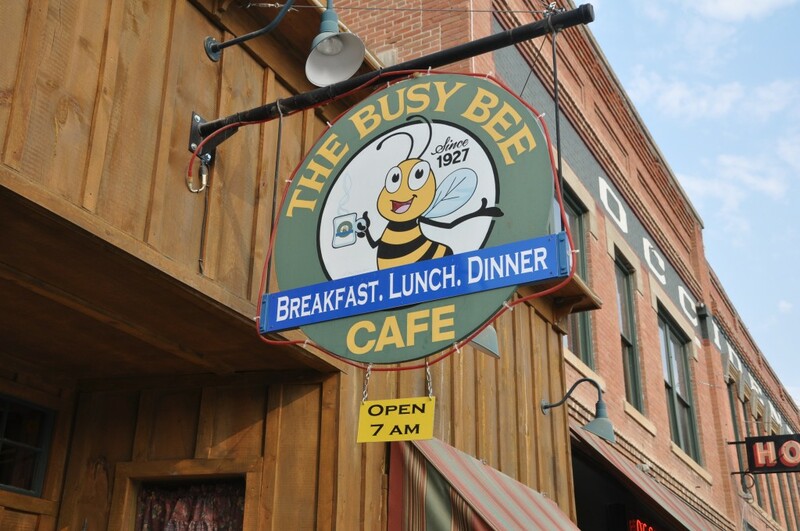 We ate lunch in the Busy Bee Café that figures prominently in the Walt Longmire books. It had a nice steady flow of customers, but was not overly crowded. 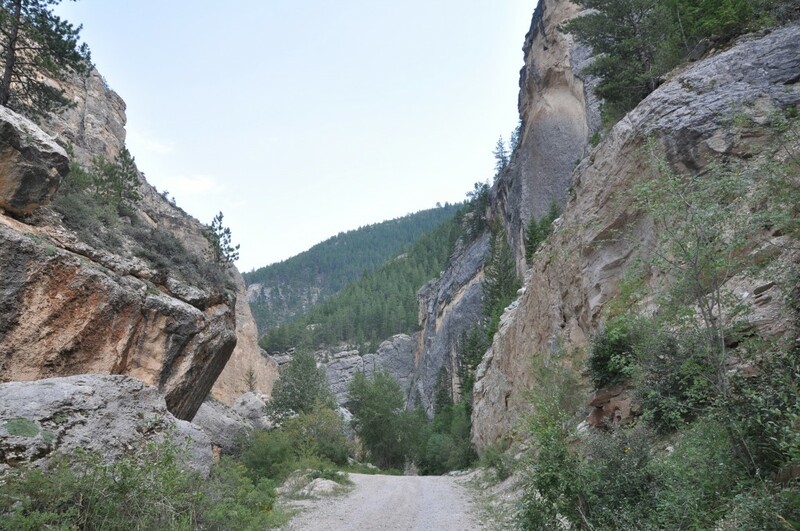 After lunch, since Longmire events didn’t begin until the next morning, we filled our time with a ride through Crazy Woman Canyon in the Big Horn Mountains not far from Buffalo. There are several thoughts as to the source of the name of the canyon. All hark back to a woman, either Indian or white, who for some unknown reason, went crazy. Maybe she was left in the canyon to fend for herself. Maybe a loved one was murdered in front of her. The source of the name is lost in time. Maybe the canyon itself was enough to bring on mental problems. A ride through it on a narrow one-lane (although NOT one-way) dirt road suggests that a person has to have at least a couple of crazy genes to travel that gorgeous but difficult route. Dinner at the Bozeman Trail Steak House completed our low key day. We dined beneath a huge map showing the dangerous and deadly Bozeman Trail that claimed untold numbers of lives during the coming of the whites to the area. A meeting of some locals was happening at a nearby table, perhaps to nail down the final details of the fast approaching Longmire Days. Or not. We finished our meal, had a “Chocolate Runs Through It” cone at a nearby ice cream shop and called it a day. Saturday turned my thoughts to the cost of fame. The laid-back town with a few wandering tourists morphed into something resembling Times Square at rush hour. 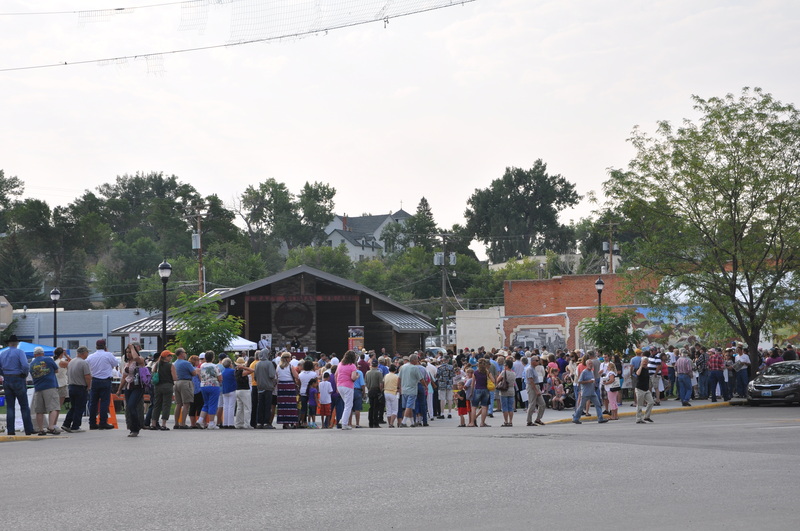 I don’t think the organizers of the event realized how popular the Craig Johnson books and the Longmire television series had become and just what they were unleashing on their small town. Friday’s scattering of fans had swelled from a trickle to a flood. The Saturday morning pancake breakfast, hosted by the Buffalo Kiwanis Club and scheduled for two hours, had to continue until almost noon to feed everyone who showed up. A young waiter hurried back and forth to the Busy Bee Cafe for help providing coffee. The lines of people waiting for the breakfast and the day’s events stretched in each direction. A review of the weekend in the real Buffalo newspaper didn’t give numbers but mentioned “thousands” of visitors. After watching the hordes of people and waiting for my husband to retrieve our vehicle from the closest parking spot he could find (several blocks away), I think the reporter was probably correct. 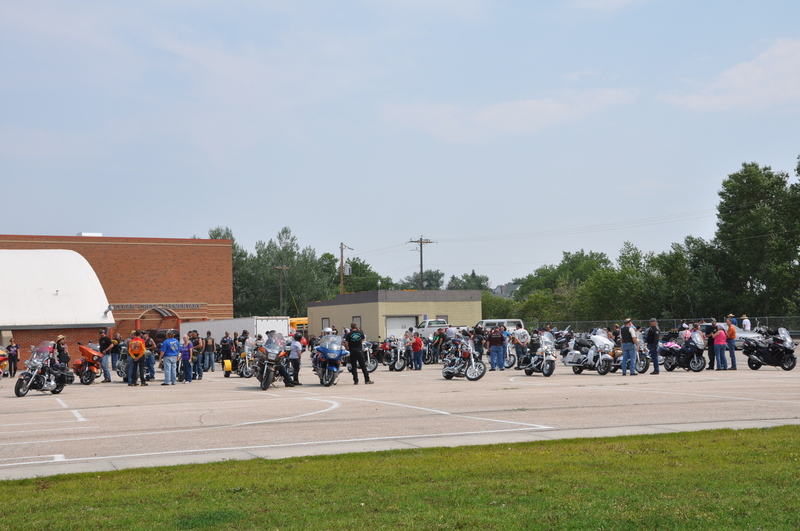 When bikers began to gather in front of the Clear Creek Brewery downtown in order to participate in the motorcycle poker run to Ucross, the gathering place had to be quickly moved to the parking lot of a nearby school to keep the arriving bikers from totally blocking Main Street. 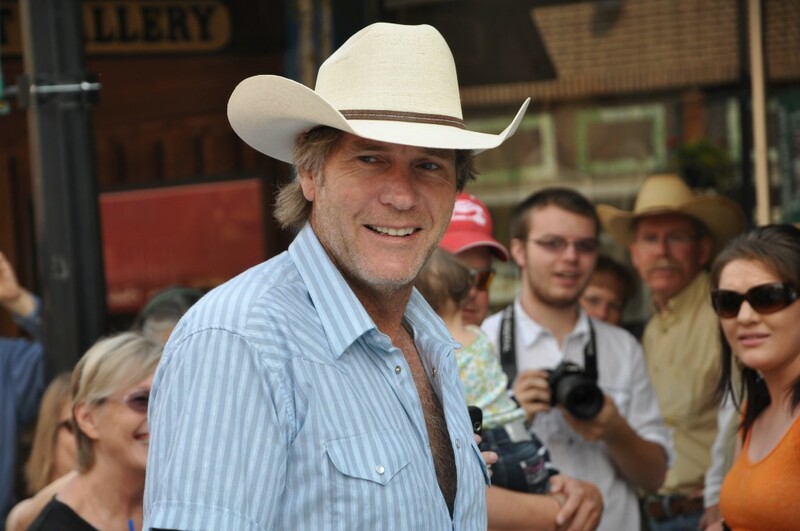 In addition to Craig Johnson’s several book signings, one major draw to this event was the opportunity to meet and greet a favorite Longmire series actor in person. Five of the main characters were present for the two-day event and were gracious and charming as they interacted with fans–talking, posing for photos, signing autographs and just being a part of the festivities. Seated from left to right are Bailey Chase, (Branch Connolly in the Longmire series) Katee Sackhoff, (Victoria “Vic” Moretti) Robert Taylor, (Sheriff Walt Longmire) Adam Bartley, (The Ferg) and Cassidy Freeman (Cady Longmire, Walt’s daughter). Robert Taylor surrounded by fans. The star-sighting day finished with a street dance in downtown Buffalo, (excuse me, Durant), and another glimpse of Katee Sackhoff signing autographs. Well done, Buffalo, Wyoming. See you next year. Keep writing, Craig. We’re eagerly awaiting your next book. Visitors, while you’re here on my website, I hope you’ll stay a while and explore.